"John Shilling" was born on February 16, 1832 in London, England. When his family moved to America, they settled in Felton, Delaware. 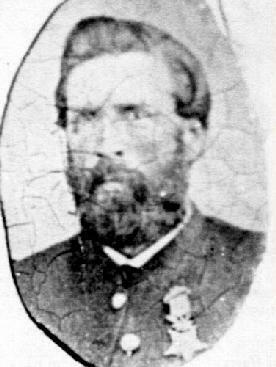 On November 13, 1861, he joined Co. H, 3rd Delaware Regiment. He was noted as being 5' 10" tall, light complexioned, grey eyes and light hair. Raised in Kent and Sussex Delaware, the 3rd Delaware Regiment found itself stationed in and around Harper's Ferry in 1862. They were later assigned with General George B. McClellan who was moving to intercept Rebel Robert E. Lee as he advanced into Maryland. They met at a place by the Antietam creek called Sharpsburg, Maryland. After Antietam the regiment marched via Harper's Ferry to Fredericksburg, where it went into battle in December as part of the 3rd Division of General Winfield Hancock's 2nd Corps. Shilling was promoted shortly after that to "First Sergeant". The 3rd Delaware was then ordered to do garrison duty around Frederick, Maryland, and in the spring of 1864, they fought in the battle of Cold Harbor. Finally, they settled in on the seige of Petersburg, Virginia. It was here, that Shilling's deed of valor came. The 3rd Delaware was assigned to Major General Warren's V Corps. Their assignment was to disrupt the Weldon railroad which was supplying the Rebel's in Petersburg. A battle ensued with the Rebel's of General Hagood's brigade. During the battle, Union Captain Dennis Daily captured the flag of the 24th Carolina. Rebel General Hagood shot Captain Daily and retrieved the flag. It was at this point, that Sergeant Shilling jumped out and captured a South Carolina battle flag. Shilling was promoted to "1st Lieutenant" on September 24, 1864, and was promoted by Delaware Governor William Cannon to "Captain" on February 23, 1865. 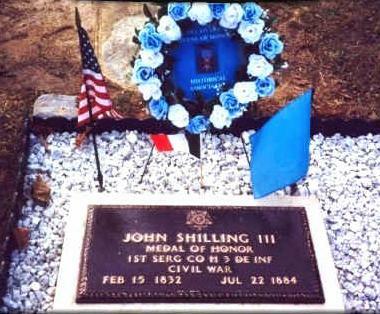 Shilling was discharged from service in Arlington on June 3, 1865. Prior to the war in 1853, he had married Margaret Kirkbride and they had seven children together: Thomas, William, Edward, Charles, George, John and Emma. After Margaret's death, he remarried to Emma Massey on July 27, 1869, and they had four children: William, Eli, Robert and Frank. 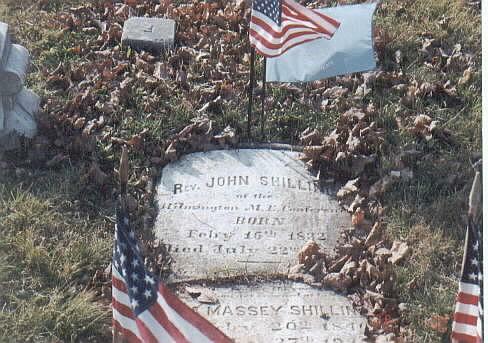 After the war, Shilling took up the Methodist ministry, (He had been chaplain of his regiment since December 1, 1864). He served the charges of Princess Anne & Annamessex in Maryland and Roxanna, Appoquinimink, Christiana and Wilmington in Delaware. In Wilmington, the Shilling's lived at 211 West 11th Street where John Shilling died of a brain tumor on July 22, 1884, at the age of 52. He was interred in the Riverview Cemetery in Wilmington. "Click Here" for John Shilling's Find A Grave record. Russ Pickett by "Clicking Here"